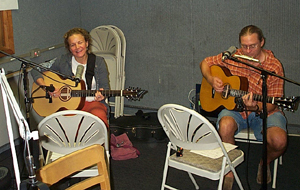 We have a touch of royalty with this week's Profiles in Folk as reigning Connecticut State Troubadour Lara Herscovitch and Pierce Campbell, Lara's immediate predecessor as troubadour, make return visits to WSHU for a "Live In WSHU's Studio A" performance and discussion. Lara and Pierce (with his group The Kerry Boys) are among the main stage headliners at this year's Connecticut Folk Festival in New Haven. 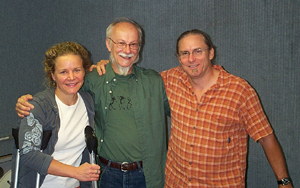 In addition to live performances and four selected cuts from their albums, the discussion was ride-ranging and included talking about this year's festival to their stints as state troubadours to Lara's appearance on "Prairie Home Companion with Garrison Keillor" to the guitars each plays in performances. Another tip of the hat to WSHU Chief Engineer Paul Litwinovich who engineered the show. Lara & Pierce: "Connecticut Skies"
Pierce: "Penny For The Boatman"
Pierce: "One Pint Of Porter"
Lara: "Letters From A Ghost"
Pierce: "A Pint Or So"
Pierce & Lara: "Knockin' On Heaven's Door"